The charming "Princess Lillifee" should be a household name to those book buyers who have ever sought a gift book for a little girl. The successful book series around the eponymous princess has become a true bestseller. Contributing to this are not only the drawings painted with love, but also the skilful color scheme and solid book embossing. 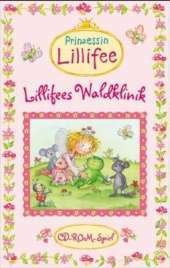 The author Monika Finsterbuch has created the "Princess Lillifee" an identification for little girls, which seems almost ideal. Lillifee has set up a forest clinic. Here she is treating the woes of her friends. She treats hare, fox, ladybugs and other animal lovers. From the series "Princess Lillifee"> With the help of clinical thermometer, X-ray machine, magnifying glass and stethoscope, the player finds out with Lillifee what the animals are suffering from> In the herb garden you can even mix health tea and ointment The game can be used in conjunction with other "Princess Lillifee" games. This creates a large virtual playground for the children.